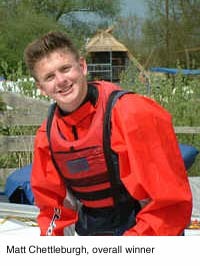 Nineteen Splash dinghies turned out at Hickling for the 2003 Travellers event on 27 May. Weather conditions were excellent, with a dry cloudy day and wind that was steady at Force 4 gusting up to Force 7. The first race was held in blustery conditions with virtually everybody capsizing before the start. Andy Jarvis had gear failure before the start so had to retire. The first beat up the Broad was hairy, then there was a broad reach up towards Pleasure Island. A reach back down the Broad and then a short run back to the clubhouse completed the course. Three laps were completed with a few retirements. Matt Chettleburgh won with Jonathon Frary second and Robert Friend third. Chris Schonhut led the second race from the start with Matt Chettleburgh and Jonathan Frary very close behind. During the race the wind dropped to about a steady Force 3, as a result Matt dropped back and finished third behind Chris and Jon. Before the third race there was a significant windshift from south-west to south which meant the start was sheltered by the clubhouse. There were two runs and two beats on the course, a good start was made by everybody, Chris Schonhut got off to a good start followed by Jonathan and a Matt. On the open part of the course there were some interesting gusts of wind which Matt took advantage of and came in first, followed by Chris and Jon.